To say the transition from schools rugby to the professional game was tough for Michael Lowry would be an understatement. The highly-rated fly-half went from captaining RBAI to three Schools Cup titles in a row to being relegated to the sidelines with a persistent groin injury for the whole of last season, halting what was a fledgling career. 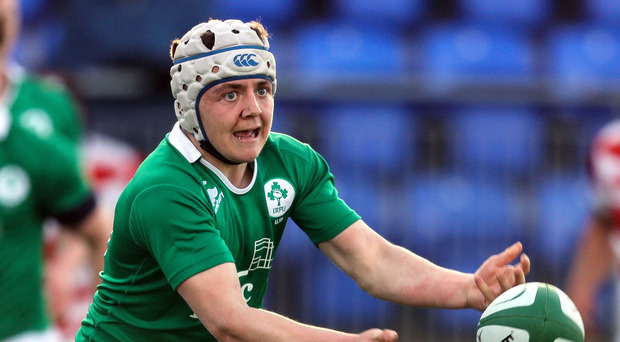 His maiden year in the Abbey Insurance Ulster Academy was a wash-out, and what would have been a guaranteed spot in the Ireland Under-20s squad for the World Cup ended up being a cameo at the latter end of the tournament. "Going from school and Schools Cups and then being plagued with injury, just one injury, for nine months, it was tough," admits the 19-year old. "Other boys were pushing on for the senior team and I found it quite difficult at times. But you know if you can get through that, it's going to make a difference to get it sorted out. "Thankfully it is sorted now. Hopefully I can start playing games." However, Lowry doesn't try and hide the fact that things were difficult. In essence, the man who is widely seen as the next top fly-half to emerge from the Academy lost a full year of development to a frustrating niggle that never quite improved. "Having that injury early on made me realise how professional the environment is, how professional you need to be to cope in the professional environment," Lowry continues. "You get mentally resilient because if you're out for a long period of time people can think 'why should I do this', but once you see progess it makes you want to keep driving standards, keep getting better and keep getting fitter and stronger. "At the time I was pretty much at breaking point. But, saying that, it's in the past now. It's gone, I'm at peak performance now and it's beneficial mentally and physically." With new man Billy Burns and the already established Johnny McPhillips holding down the fort in the senior squad at fly-half, it is likely Lowry will start the season at All-Ireland level with Banbridge. However, he has been training with the senior squad in pre-season, a vote of confidence that will see him firmly in contention for a spot in a matchday 23 with Ulster. "It's been weird (training with the seniors), because obviously you were watching them on TV a couple of years ago and you don't know them," Lowry laughs. "Now you're actually talking to them, they're your mates now, you can go around and chat away with them. It's pretty weird." It is helpful for Lowry to have one familiar face among the senior squad in the form of his coach at both RBAI and Banbridge, Dan Soper, who has been added to the coaching ticket at the province. "I have worked with Dan for four or five years now, it makes you feel at home in a way," Lowry says of Ulster's new skills coach. "It comforts you, you know what he wants from you and you want to deliver that for him. "I have so much trust for him and he has trust for me. So it's good. I think trust is a big part of the game... he's been beneficial for the skills. He hasn't really changed at all since school. So it's good to have him in." And ahead of the new season, Lowry has been adding another string to his bow that he's already tested out while on Ireland Under-20 duty. "I've played quite a bit at fullback (in training)," he reveals. "I played there in the Under-20s championship against Japan and I've played a bit there in pre-season, just to get more variety in my game I suppose. "It's beneficial to go out to 15, and from a kicking point of view as well if you're in the back-field you feel comfortable to kick back."